There are a number of reasons you may want privacy when traveling with your Prius, especially when stealthing in parking lots, or a quick change of clothes, or if nature calls and other options are not close by or convenient. First, get your side and rear windows tinted with the legal amount allowed by your state. Any tinting is better than nothing. 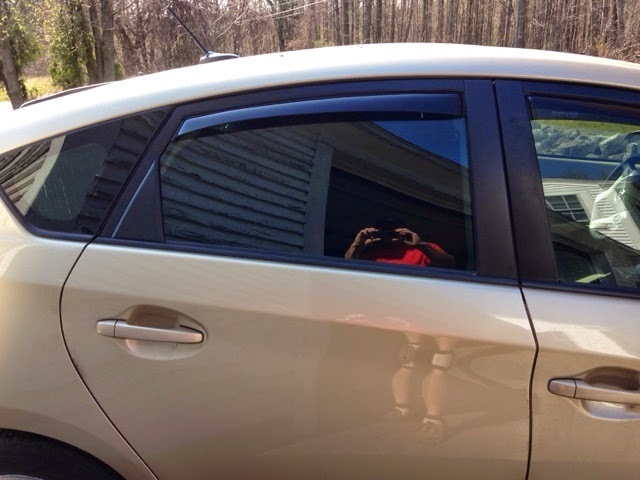 My picture above has the side and rear tinting that still complies with Massachusetts tinting laws. Second, install all side window rain guards. This allows you to crack your windows to get cross ventilation using all four windows while you are in the back of your car seeking privacy. The rain guards also block any gaps you have at the top of your curtain in the window. 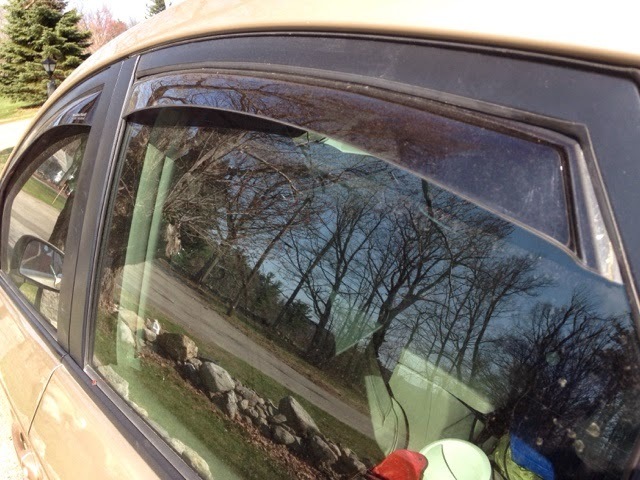 I purchased WeatherTech rain guards as seen the picture above. 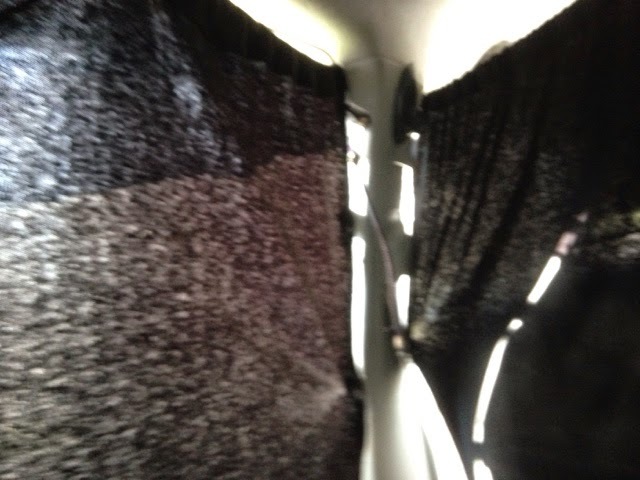 Third, install black lightweight curtains. 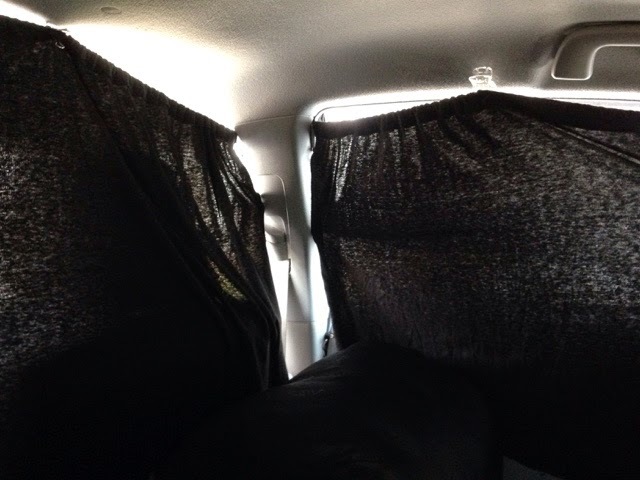 I found curtains are best to block visibility to the public into your Prius road home. The fabric I chose was light weight, not the heavyweight light blocking material as some may suggest. Above visitor same window with my lightweight black curtains. You can't see in at all in the picture above compared to the first. The Prius is small and my curtains are hung on lightweight bungie cord. The use of bungie cord allows for the curtain behind the front seats to rest on the back of the seats. When I am in a semi inclined position, when in bed, my back is to the curtain and if it was hard fixed to something like a rod or Velcroed, and if I inadvertently slide down into my bed and pull on the curtain nothing breaks and you can feel the resistance and release the curtain. In full daylight sitting in the front drivers seat I can lean and reach and close the two rear side curtains as well as the long curtain behind the front seats. I Velcro the sides back when I get into the back seat. Once the three curtains are drawn I get out of the drivers door and enter the rear drivers side door and step in and sit. I then Velcro the sides if needed and close the rear curtain. The privacy cover over the rear hatch area is already closed as this is how I drive to hide my fridge and sleeping bag. I do not generally advertise I am a Vandweller by people seeing into my car. This also means I close the rear side curtains when I park wher I don't want people looking in. 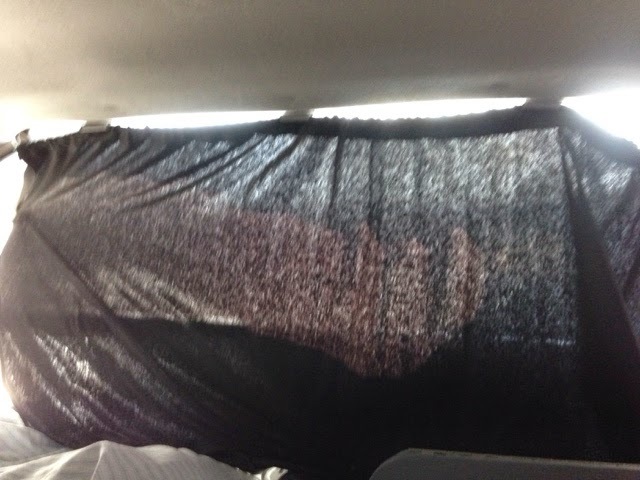 The above picture shows the rear curtain installed from inside. With all four curtains closed all people see from outside are the darkly tinted windows that look black because the curtains are drawn. Yet on the inside you don't need a light on to shine out as the black curtain material is somewhat thin light comes in through it sufficient to see perfectly fine during the day and in a lit parking lot like Walmart or a trucks stop. 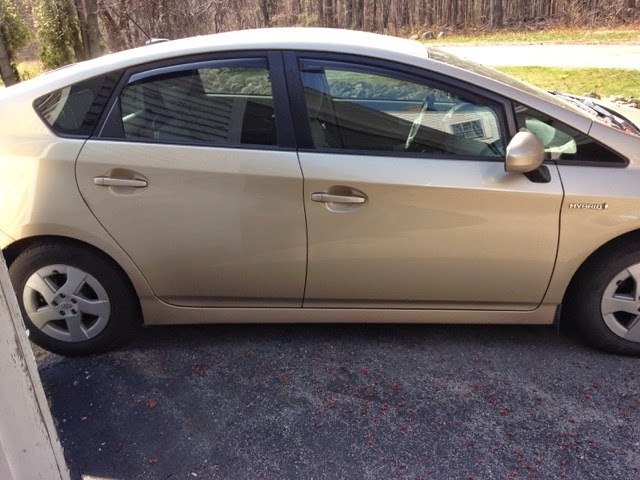 The picture above shows black curtain & privacy screen that comes with the Prius in place with hatch open. When closed there is no viewing in. Many a day I had on long pants to start the day and wanted to change into hiking shorts for a mid morning hike. I would be parked at trail heads or busy parking lots and often changed my clothes in privacy. In Casino Parking Lots or truck stops, where I stayed the night, I would fully change for bed, wash up, brush my teeth, wash my hair & body, wet shave or randomly used my homemade potty and never had a problem with privacy. I am not saying all this is as easy as living at home to start, but is is reasonable to do and with just a little practice each activity becomes a new normal. 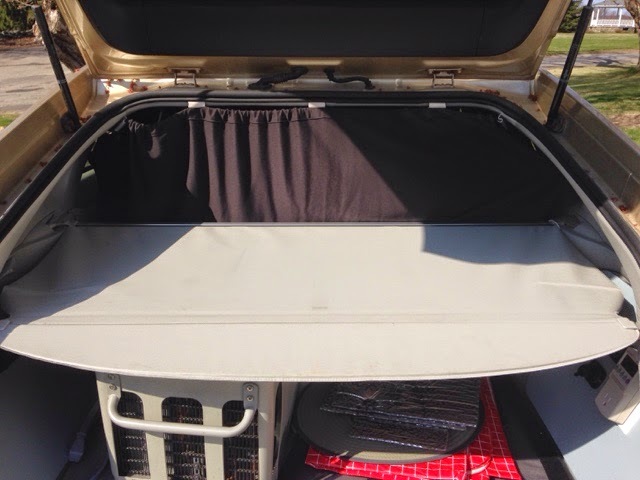 All privacy items I mentioned I also did in my 2014 Travels when I had my Class B Campervan and this year all I did was create the ability to live in my Prius much the same way I did in the Class B.
I know this way of living is not to everyone's liking. If you are finding what I have written here difficult to consider, think of this. Would you hike the Appalachian Trail camping every night? How would you manage your privacy for the activities I mention above. There are not always bathrooms, you will not be putting up a tent every time you want to change your clothing. Sleeping in a car offers advantages in bad weather. When it's cold outside the car is always 10+ degrees warmer than outside. I slept fine at 19 degrees in Bryce Camyon with only my sleeping bag. There is nothing to pick up in the morning that is damp and dirt is stuck to it. The list goes on. She has a completely different approach to her Prius living that works for her. She has a tendency to stay put for a period of time before moving again, where I move most days to a new location. I met a woman Saturday night at a church dinner and we discussed my travels and I could tell she was interested and had hopes that her friend who was with her my consider the concept. I gave them each a my Travels business card and I hope they read these blog posts as you only need to take small steps first. The Prius is not the Campervan vehicle for everyone. For two people the Prius is possible but you must make significant trade offs from what I did. For two people you may want to live more out of your Prius than in it. You may want to look at minivan for more room to sleep, to a full size van to live more in than out. In blogs I read most that ask think about 2 people in a full-size van. For some couples find that over time the small space will become a problem even in s full-size van. To me it all depends on what you plan to do for how long. I concur that if anyone that desires to travel / live this way is to start off slow and try it on short trips and see what works for you. I had my own doubts that I could last a month in the Prius never mind 3.5 months and in the end it worked for me and I liked it. The key to small spaces is to ensure comfort and organization with the fewest things possible. I will be reviewing more tips from my trip and living a minimal life on the road. Awesome! My wife and I are converting our 2014 plug-in to a "camper" (i.e., instead of dropping tens or hundreds of thousands of dollars on a travel van). So stoked to learn that I fit in the back (I'm 6'5). Thanks for the great ideas and inspiration. What kind of clips and pins are you using to hold the bungees? What kind of clips are you using on the back door? Are there any leaks in your system? Many thanks! I’m glad my blog is helpful. I do recommend trying out car dwelling to test out everything. First night could be in your driveway or back yard. The key is to know what works for you. Our first Prius gathering at Cheap RV Living’s RTR was impromptu. There were pioneers before me that I learned from online. I met Suanne in her whit Prius, and David in his green Prius. We each were Prius dwelling and we each approached how we did it differently. I respect both highly for how they do what they do and friendship. Suanne lives in/out of her Prius, carrying equipment to set up camp but sleeps in Prius. David and I are intact and can drive away at a moments notice, but after that we are different. He cooks on an inductive cook stove where the front passenger seat is. I keep my front passenger seat for guests from time to time. Others have followed us doing their own thing. It’s great to see what they have done and how they live. My choice was to engineer my design over and over to make it better. I love designing and sharing. I use a plastic starter strip for vinyl siding. I cut it in 1-2” pieces and then shorten the length to 2-3” long. This plastic easily slide behind moldings used in many vehicles leaving just the loop end that a bungee cord (shock cord) in. I tie a knot at the end with a split key ring to be able to easily grab. The bungee is inserted at the top of curtain and keeps the curtain in place. At last year’s RTR I had parts to help car dwellers and show them how to instal.